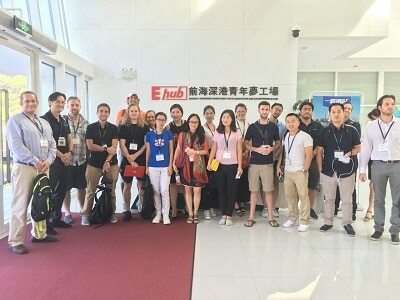 Friday July 29 was an intense day of touring warehouses, learning workshops, and networking – from early in the morning until late at night! We had people coming from all parts of the Pearl River Delta – Hong Kong, Shenzhen, Zhuhai, Guangzhou. So we had a cross border van take a group from Hong Kong bright and early at 8am, and then those meeting up in Shenzhen met us at 9am at the Da Xin metro station, and those coming from Zhuhai took a ferry and taxi, while those from Guangzhou took a train and taxi or subway. Such a huge logistical coordination. I have to say that Wechat really helped a ton. We had various Wechat groups set up for different travel groups, and helped answer questions and coordinate logistics in real time. If this was before Wechat, it would have been a lot of phone calls and one to one text messages with delays and confusion. 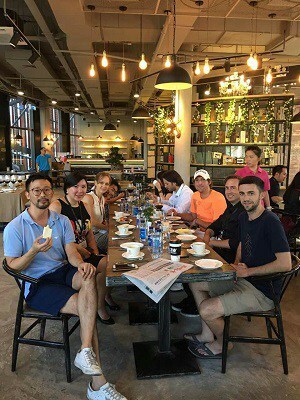 Then there were a few who wanted to drive directly to Qianhai to meet us. What we didn’t seem to make too clear was that the bus we had was necessary – it was how we would transport people from one company and office to another throughout the day. Everyone met at 10am to start the day off. The morning was two different company warehouses to check out. We had to get inside the Free Trade Zone, which is a bit difficult for a 20 person tour bus! There was a bunch of questions at the security point, but one of the companies helped us write an invitation note so we could drive in. The warehouses were big, but quiet. They said it could send up to 2,000 packages a day, but currently more on the B2B side rather than B2C. B2C shipping is a bit more of a high frequency and more complex procedure. Talked a bit about IT, plugging into Chinese sales channels, and the future of their logistics companies as well as the long term idea for Qianhai Free Trade Zone. We got to go to lunch a bit early – it was HOT! Loading back up the bus, as well as picking up lost attendees on the way – we went to a brand new shopping mall. This whole FTZ is one big construction site for the most part still, and it is still amazing to see China developing up like this still. We had a private room upstairs for lunch. Two big tables to fit about 12 people each – with traditional Chinese food served. 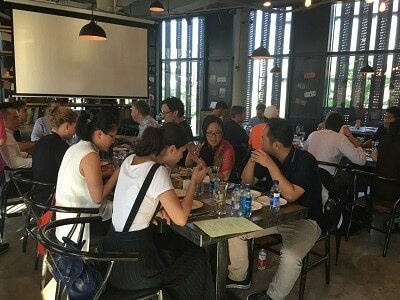 Of course, meals in China are not just about the food – it was a lot of networking! Name card trading, Wechat adding, and deal discussions. And of course, a group photo. About 1pm we left and headed off to the afternoon seminars and workshops. The Logistics companies sharing about how the free trade zone works, and how to take advantage of it for importing and selling into China. A Chinese bank (yes, we got a bank!) to share about how to open a bank account for your Qianhai business. 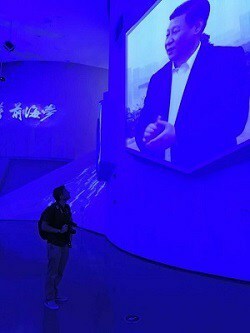 The government shared about the port, and the long term plan for Qianhai. 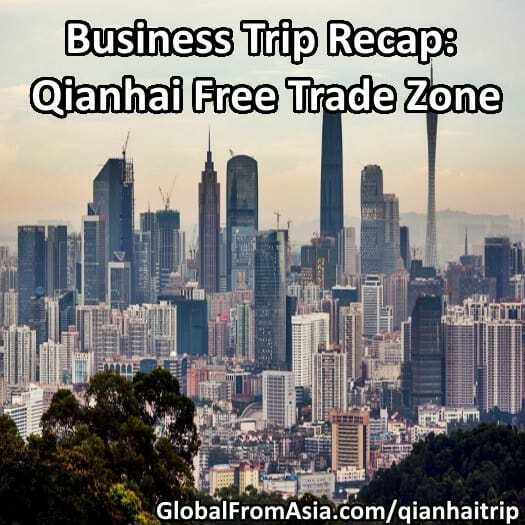 A corporate setup company shared about how to establish your business in Qianhai. This was a tough one, first to convince these companies to share – and also the language barrier. 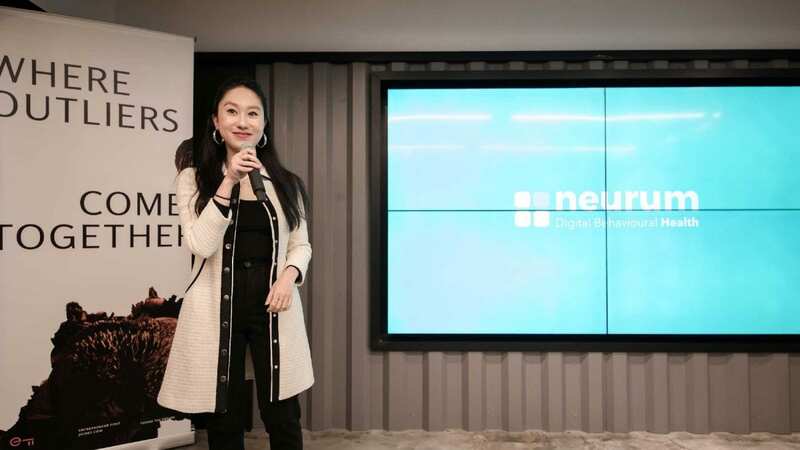 Sure, we could have gotten foreigners to share in perfect English – but we want to have the direct Chinese business expert to share. We’re here in China. But we really required them to present in English and pushed as much as we could to keep even the question and answer session in English as well. 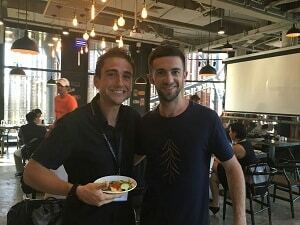 Some of the presenters had better English and presenting skills than others – but the content was fresh, new, and valuable. I have to say, I think this is one of the first events in English talking about Cross Border business in China. Even some of the Chinese attendees said they couldn’t figure this stuff out before – in Chinese! That it is so confusing – and these presentations really broke it down and made it more simple to grasp. We wrapped up the seminars at about 4pm, then did a tour of the Qianhai exhibition centre. 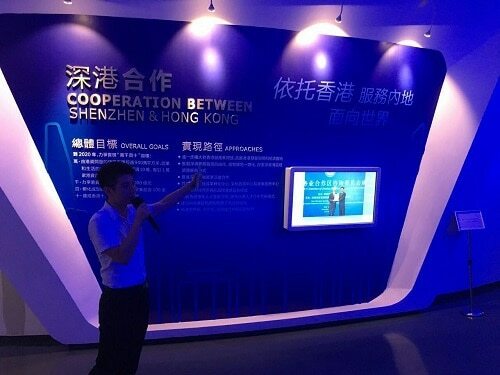 This was like a museum of the history of the free trade zone, with a live tour guide (In English), videos, and a 180 degree movie showing the long term plan of this new “Manhattan of Asia” center. So hard to explain in a text blog, but this massive construction zone will be built up to be a modern city within Shenzhen, full transportation, residential, educational institutions – people living and working here will never need to leave. After an action packed day, we headed over to dinner. Starting a bit early – at 5pm, we did have enough time for more networking. We had each person stand up and introduce themselves, and what they are looking to do and who they are looking to meet. This helped us get people to meet more people who could help in their businesses. Overall the day was a great networking event. A group of a bit over 20 people, we all got a chance to know each other more and I have a stack of business cards on my desk as I make this recap. We finished things up at about 8pm, the Hong Kong visitors loaded up in their cross border van, and the others shared taxis or went back to their cars they had driven over. It was a ton of work to put this together, but the most exciting part is that people enjoyed it, learned something, and made some new business contacts. That is what I love to do, and we are collecting feedback and making plans on how to fix this going forward. We plan to have these cross border business trips on a regular basis, maybe every 3 months so bookmark that page and I hope to catch you at them in the future! Qianhai is one type, we will have more to come.